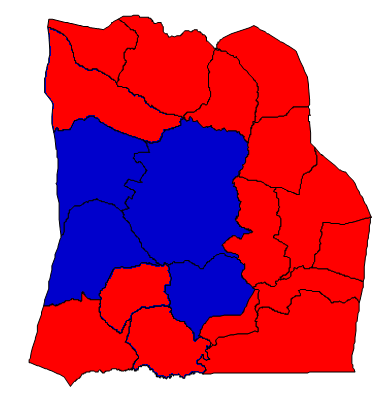 Duplin County is located in eastern North Carolina. The 2010 population was 58,505. The county seat is Kenansville. It was founded in 1750 and named for Thomas Hay, Viscount Dupplin. The county is known for agriculture, in particular hog, chicken, and turkey farming. The Duplin Winery is the longest operating winery in the state and is popular tourist attraction. Despite a strong Democratic heritage, Duplin County is now Republican territory, at least in federal elections. The Board of Commissioners is still controlled by Democrats, and until recently legislative Democrats were strong here. In 2012, Mitt Romney carried Duplin by a 55-44 margin over Barack Obama. Pat McCrory won it by a slightly larger margin in his election as governor. An inelastic county, whites here are near solid Republicans at the presidential level and there is little room for Republicans to improve. Duplin County has the largest Hispanic population of any North Carolina county. As of 2010, Hispanics numbered almost 21% of the population. Forecast: Duplin County used to be so Democratic that it even voted for Michael Dukakis in 1988. It also backed Bill Clinton during both of his presidential runs. Duplin backed George W. Bush in 2000 and since then has consistently supported Republican presidential candidates. Downballot, Democrats are stronger and white voters are more persuadable to back Democratic candidates. Kay Hagan won Duplin County by an 8-point margin and has a chance to carry it again next year. Given the large Hispanic population, one would think Democrats would be much stronger here. But Duplin’s Hispanics have some of the worst registration rates. Tellingly, there are some precincts where Hispanics are over a third of the population, yet gave Romney about 3/4ths of the vote. The overwhelming majority of these Hispanics are agricultural workers who do not speak English well and do not vote, and getting them organized will be very difficult indeed. The growth rate during the 2000s was 19.24%, above the North Carolina average and well above the national average. The Hispanic population is growing by leaps and bounds, but the growth in the white population is not insignificant. Demographic trends do not favor African Americans, but this group is more politically powerful than ever due to registration efforts conducted by the Obama campaign. Overall, Duplin appears to be a more desirable county to relocate to than several other agricultural counties in the eastern part of the state, but the growth rate this decade is not expected to be as strong. Duplin should remain static politically, as it has for the past decade or so. Whites are now unanimously Republican at the presidential level and increasingly Republican at the state level. Blacks are declining in terms of population, but are registered to vote in higher numbers than ever. The Hispanic population also bears watching, and if these people are registered en masse then Duplin should become a Democratic county, but this is unlikely to happen in the near future.